People love to share their opinions and thoughts. A lot of the questions that readers submit to me via email are ones that I post as reader questions. I learn so much from the input that you all post! As you’re going about your day, look for simple things you do that others might find helpful. Maybe a time-saving tip, a kitchen tip, an organization tip… anything you do that makes your life easier and might be helpful to someone else, too. Sometimes it’s the simplest ideas that are people’s favorite posts! When you are reading articles or books, write down quotes you love or thought-provoking ideas you come across. A simple quote or idea from a book can be a great springboard for an insightful post. I keep a running log of these ideas/quotes and they are instant blog fodder on days when I need a quick post idea. Did something funny or interesting happen to you that day or week? Share it as a post — especially if there’s a great example or lesson you learned from the story. Have a kitchen gadget, app, or other sort of tool that is a life-saver? What about a product you just love? Write a quick post about it. Sometimes, few words are needed. In addition, if you’re answering a comment and your answer begins to get lengthy, consider turning it into a blog post instead. Example: Is it Possible to Survive on a $30/Week Grocery Budget? Are you trying to decide which paint color to use, craft project to try, or book to read next? Why not ask your readers? I bet they’d love to give their input — and these types of posts always bring out lots of responses and fun engagement. Example: What Should I Do With All These Canned Biscuits? If you read a great book, don’t keep it to yourself. Write a quick post sharing your thoughts on the book and why you’d recommend it to your readers. Top 10 posts are always a hit — and they are usually pretty simple to put together, too. Best of all, the possibilities for Top 10 lists are just about endless. Can’t come up with 10 ideas, share 9 and ask your readers to supply #10. Readers love giveaways. And they love them even more when you give away something of your own — even if it’s something small. Put together a fun little package of goodies and write about why you chose each item and then give the package away to one commentor. 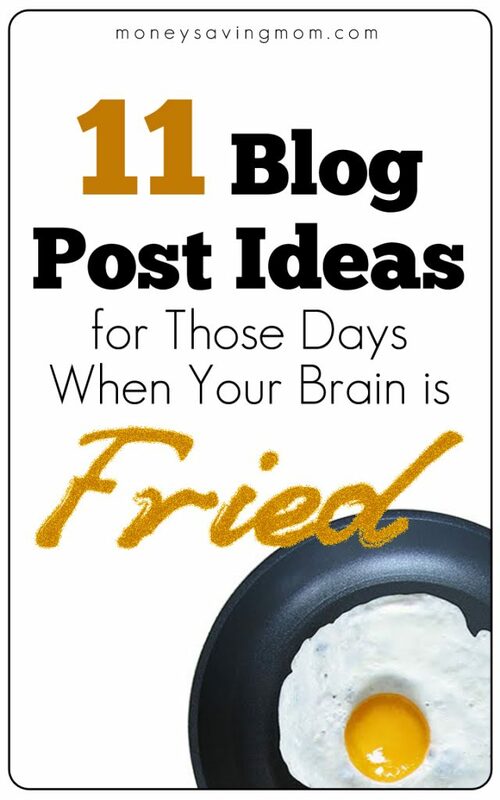 What are your ideas for quick & easy posts you can write when you feel like your brain is fried? I’d love to hear. I love writing book reviews, and you’re right, it gives me something to say even if I don’t feel creative. But the best part is sharing about great books, or sometimes explaining why I think a book is not good. Now, off to have some real life fun and swim with the kids! I thought you were just going to have the list, but your example f each one is great! I decided that my brain being fried is due to menopause starting, so I can ride that one for a few years…then I’m out of excuses! This is my favorite post in this series! I’ve had several ideas within these categories in my head recently that I have been planning for future posts. I bookmarked this post to help me remember! Thank you so much for this post!! I have been completely brain fried and stressed out lately and have had to take a break from my blog. This post gave me the push I needed to get back into it as well as some ideas to fill in those days I need something quicker to post. Thanks for this series, so helpful! As a new blogger I have many ideas but get tangled up in execution, your suggestions will be a big help. Thank you for this post! I have been trying to be really consistent with my blog and am traveling this week and having a hard time coming up with quick ideas. I think I’m going to do a 10 Links I Love post! Thank you, Crystal!